Do you know anyone who likes to wait on hold? A majority of customers believe it takes too long to reach a live agent and they prefer a call-back over waiting on hold. Call-back technology is an automated service that gives customers an option to receive a call-back (a return call) instead of waiting on hold. When a live agent becomes available, the next caller in the call-back queue can receive their call-back. It is sometimes called “virtual hold”. Call-backs give your customer the gift of time, our most valuable commodity. With the option to receive a call-back instead of waiting on hold, they are free to get on with other tasks knowing that a live agent will call them back as soon as possible. “Your call is important to us. Please stay on the line and an agent will be with you shortly.” Every customer has a limit on how many times they are willing to hear that message before they give up – and hang up. With call-backs, customers don’t even have to hear it once. Customers become frustrated while on hold. When a caller is upset, calls tend to take longer – the customer wants to complain, or their frustration naturally makes effective and clear communication more challenging. Unexpected call spikes make it difficult to maintain the level of customer service you aim to provide. You have a limited number of agents. With a call-back solution, peak periods are smoothed out by deferring calls until volumes are more manageable. reduces the number of repeat callers. When a caller is on hold, a phone line is occupied the whole time. When that line is a toll-free DID (Direct Inward Dialing) line, the cost is even greater, usually with premium per-minute charges. When call-backs keep your lines open, you save money on your telecommunications system. Cranky customers who have been waiting on hold are not enjoyable for your agents to deal with. Especially during peak call times, serving one angry caller after another can become disheartening and unmotivating. Knowing that customers don’t like to wait on hold, offering a call-back is a simple and cost-effective solution for improving their experience and boosting agent morale (which also improves customer experience). 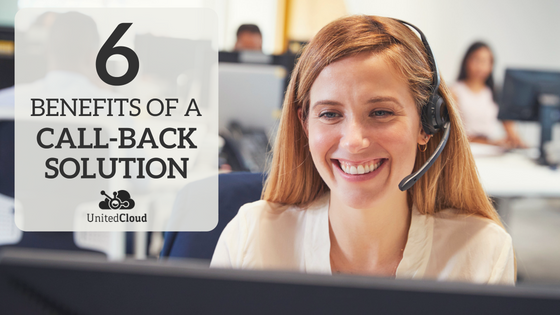 Call-backs deliver return-on-investment (ROI) for your business. Whether you have one employee or a full-size call center, call-back technology can work for you! Contact a UnitedCloud call-back solutions expert to find out how you can improve customer satisfaction, increase agent efficiency, boost productivity, and reduce costs.